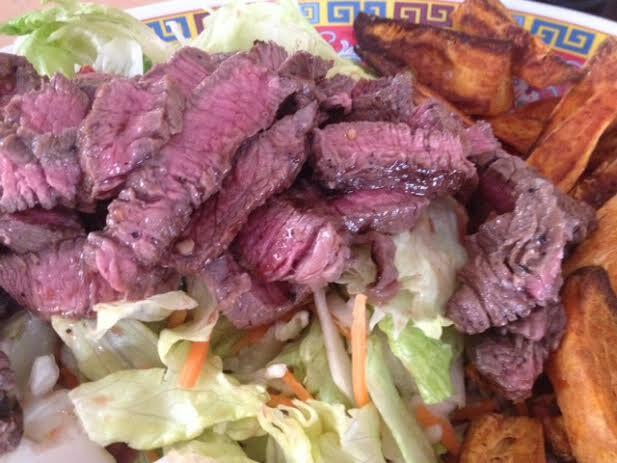 Brazilian steak salad with a warm tomato salsa. First England World cup game tonight, the older girl is back from Uni and the sun is out. Sounds like a good excuse for a BBQ. As we are rooting for England in this house perhaps I should be serving flacid pink sausages and a partly cooked chicken drumstick with pudding being a dose of food poisoning. As we have a party to go to tomorrow, I decided to swerve this option and focus on taking my cue from the flavours beloved of the host country Brazil. 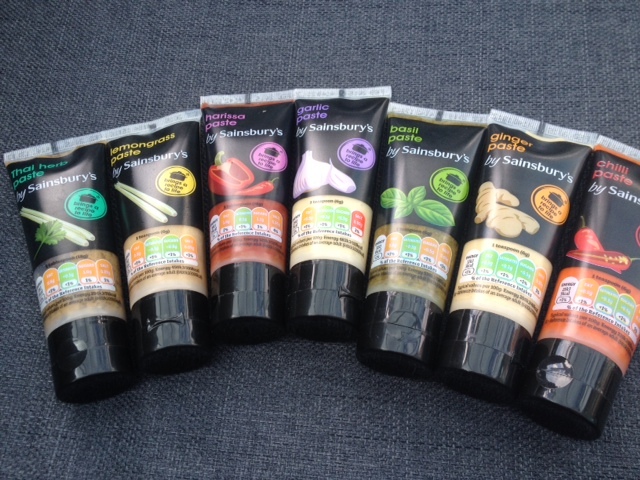 Sainsburys have very kindly sent me some of their new pastes and I used the garlic paste in this dish.Interestingly this is not a puree but a proper paste with the garlic still in larger pieces within the paste. Given the sizeof the country and the wide variety of climates and ecosystems, there are so many posibilities. River fish from the Amazon, seafood from the coasts, fruits and herbs from the rainforest and cattle from the Pampas. Added into this the foods that the Americas have given to the world in the form of tomatoes, potatoes and sweet potatoes. You can see I had a lot to choose from. This is what I came up with, bear in mind I wanted to use the BBQ and had a returning teen to treat too. 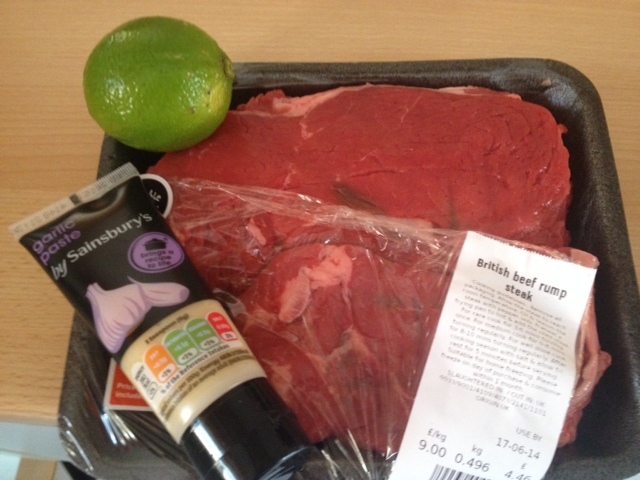 Steak, check, limes, check, garlic, check and tomatoes, check. All set for a Brazilian inspired supper. To accompany this dish I served sweet potato fries and a big green salad. 1 lime juiced and the peel cut into chunks. 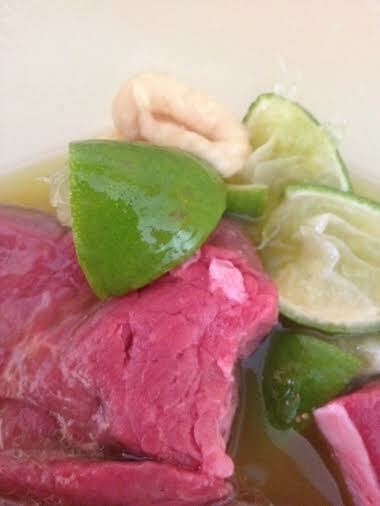 Chunksof lime in the marinade. Halve the lime and squeeze the juice into a non metallic bowl. Cut the remaining limeshell into chunks and add to the bowl. The skin contains oils that really enhance a marinade. Add the oil, salt, pepper and garlic paste. Mix well. leave to marinade for 30 minutes. Waiting to be warmed on the BBQ. a good selection of tomatoes, if you have different varieties, colours and sizes al the better. Use the foil to make a simple foil tray, take a length of foil. Fold it in half. Pinch the corners to form a trayshape. 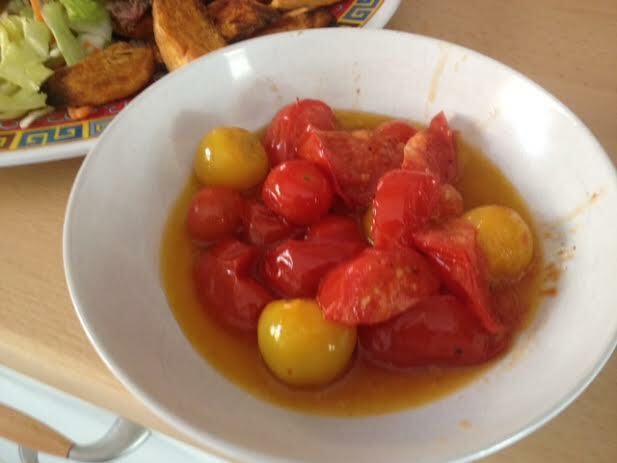 Cut any large tomatoes into quarters, as you want the tomaotes to soften at a similar rate as they cook. Place in the foil tray. Tumble in the smaller tomatoes. Cover with a slug of olive oil, drop in the butter and season generously. 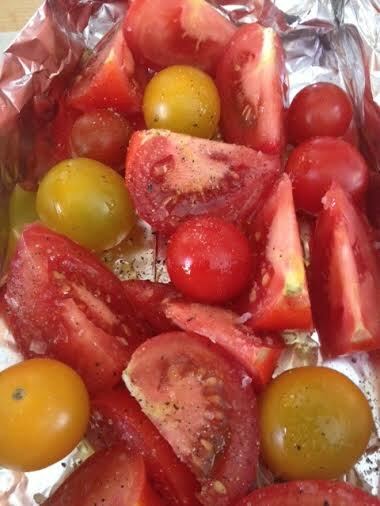 Place the foil on the BBQ and allow the tomatoes to bubble away until they soften. Serve when soft but not pulpy. Decant into a bowl and use in place of ketchup. Forgot to wipe the bowl, sorry! Place the steaks on the BBQ and cook until they are on the rareside of medium. Allow them to rest and then slice thinly. Lay a bed of salad on a serving dish. Top with the ribbons of steak. Place the warm tomato salsa to one side and the sweet potato chips to the other. Open a beer and hope above hope that England can actually win!